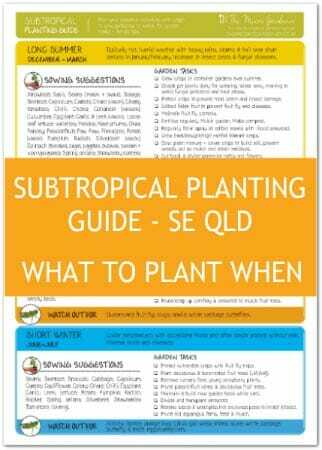 Do you live in subtropical SE Queensland? Are you sick of trying to figure out what to plant each season? 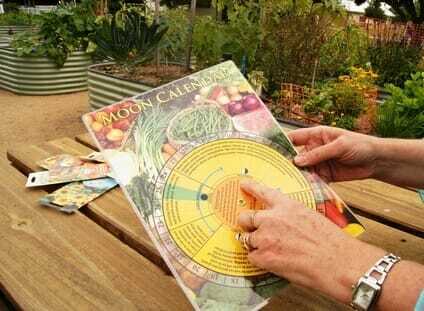 My double-sided, laminated guide can help make your seasonal planting and gardening activities so much easier. 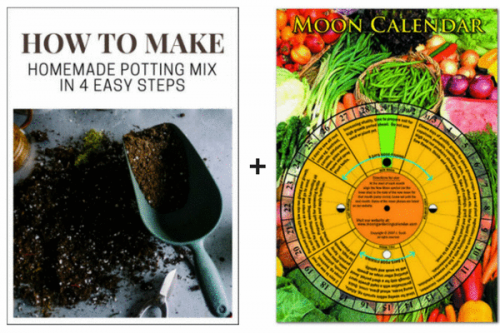 This great value tool is perfect for beginner or intermediate food gardeners. 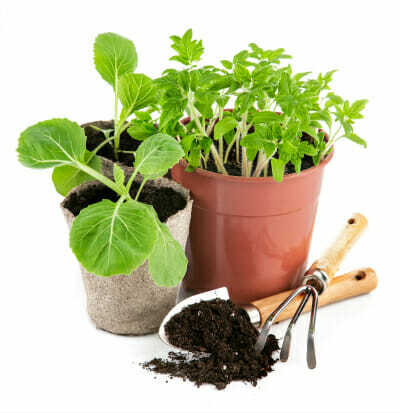 It can help you with pests and diseases to watch out for at different times of year; when our 5 seasons start and finish; seasonal garden tasks; and which edibles to plant all year around. Do you live in subtropical SE Queensland? Are you trying to figure out what to plant each season? 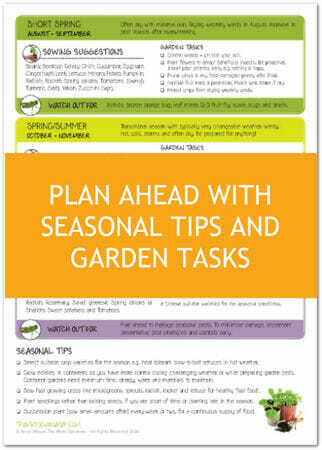 My double-sided, laminated guide can help make your seasonal planting and gardening activities so much easier. 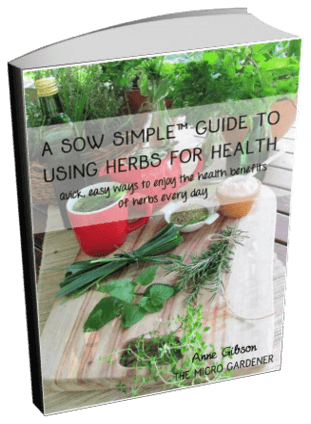 I’ve put a barrow load of time, research and experience growing in this climate into creating this guide. The Subtropical Planting Guide is a great value tool. want an easy-to-use reference guide to use year after year. Seasonal colour-coded sections to make it simple to use. Laminated for long-term, practical use indoors or out in your garden shed. Tick boxes so you can mark off each activity with a whiteboard marker pen [not included] and keep track of what you need to do. 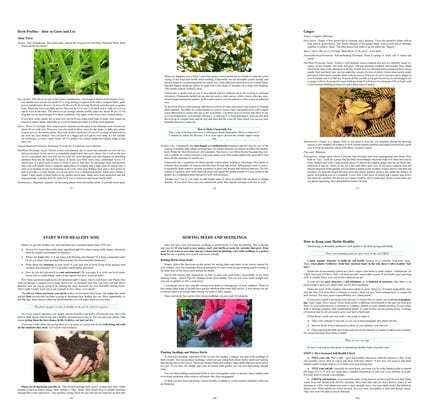 Each of the five seasonal sections provides typical climate conditions, sowing suggestions, garden tasks and common problems to watch out for. 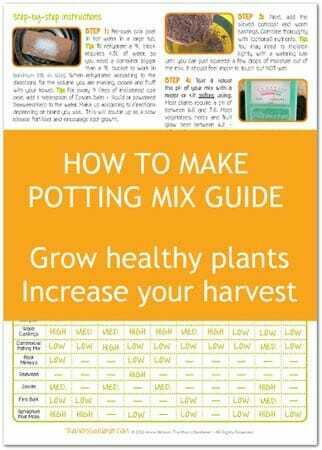 Includes a list of food crops you can plant year round and bonus seasonal tips to optimise your harvest. 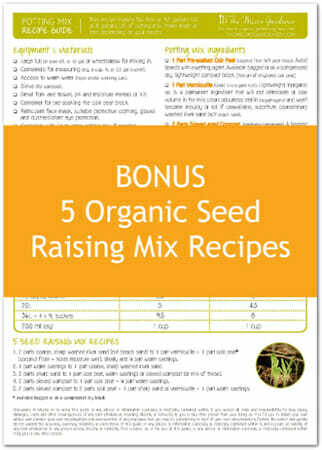 This attractive guide makes an economical gift that will last for years. Compact size for keeping on your fridge with a magnet [not included]. Product specifications: A4 size; double sided; laminated; full colour; waterproof. 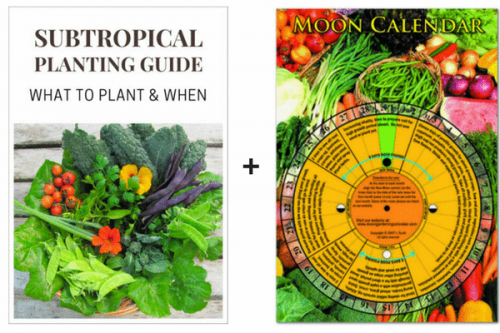 How can I use the Subtropical Planting Guide each season? The Guide has five seasons with the typical months they start and finish. Sometimes this slightly overlaps and the seasons don’t necessarily start on the first of the month and finish on the last day! e.g. Spring usually occurs over August and September but typical conditions may not start until mid-August. The Guide gives you a brief description on typical weather conditions to look for, so you can learn to be observant and pick up the clues when the season is changing. e.g. During spring there is typically an increase in pest insects after overwintering finishes. 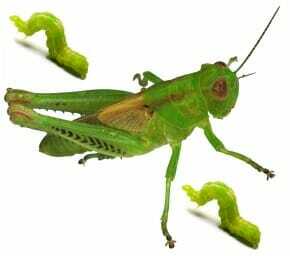 This enables you to plan for lots of grasshoppers hatching and put your controls in place before they damage your plants. Knowing what is going to happen when, gives you more control over your garden. How do I use the ‘Garden Tasks’ suggestions? These are easy reminders to help you complete important tasks that should be done each season to prevent problems. 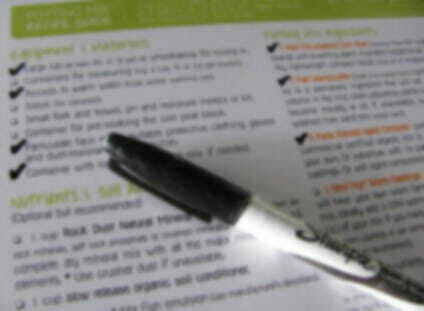 Each garden task has a tick box, so you can use a non-permanent whiteboard marker to check off when completed. This makes it simple to know you’ve got your bases covered. e.g. If you know that Spring is a time when you’re likely to experience drying winds, you can plan ahead and protect vulnerable plants from damage. Not sure when to fertilise or prune your fruit trees? How to prevent weeds? These tasks will help you time your activities to maximise success. How will the ‘Sowing Suggestions’ help me? This is a list of common edibles (vegetables, herbs and fruit) that you can plant confidently during the suggested season. 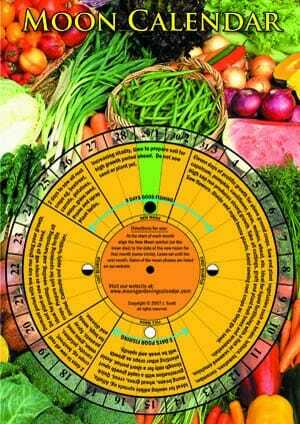 Some foods will have a month in brackets indicating the ideal time during the season to sow. This is usually due to temperature changes in the weather and soil. Once you are familiar with planting edibles in the suggested seasons, you can learn to create microclimates in your own garden. 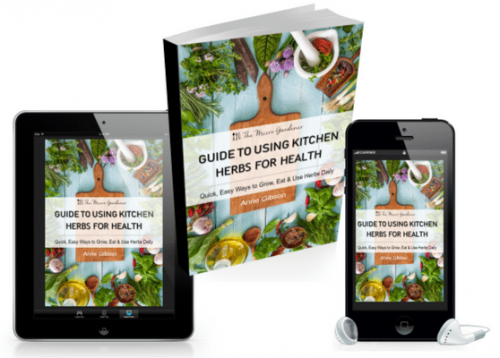 This will help you extend the period in which you can grow some edibles. 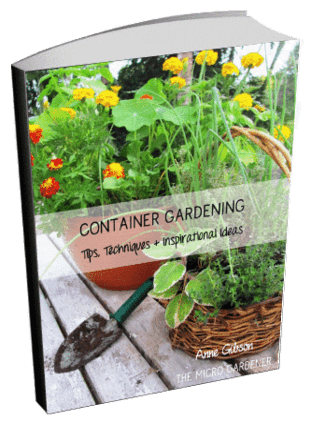 To make the most of this guide, it is recommended you also keep a Garden Journal. This will help you record observations in your own garden that are unique so you can build your knowledge year after year. I provide easy templates and worksheets you can use if you like the idea of a Garden Journal Planner & Workbook in a folder. How do I use the ‘Watch Out For’ tips? These are common pests to look out for each season. e.g. aphids, citrus leaf miner and scale. You can look ahead to the following month and know what’s likely to be appearing in your garden at that time. e.g. Knowing when the QLD fruit fly is commonly present, will enable to you install your baits and controls to prevent fruit loss and future infestation. 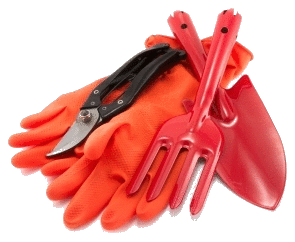 Being prepared before pests appear will make a huge difference to your harvests and managing pest problems in your garden. How do I use the ‘Edibles to Grow all Year Round’ suggestions? These crops can be planted and grown all year in our climate, if you choose varieties suited to the season you’re growing in and select containers or microclimates to favour their preferred growing conditions. By checking the seasonal Sowing Suggestions, you will see the times they are most suited to and you can create these conditions in your own garden. See the Seasonal Tips section on the Guide which will help you implement these suggestions successfully. 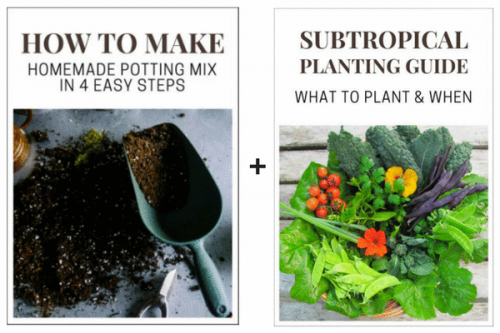 By subscribing to my newsletter and following my blog, you will also learn more about specific plants to grow throughout the year. I have another question not answered here. Can you help? Of course! Click on Discussion (just above this product description) and Leave a Comment with your question. You can also use the Contact Form to send your query. This looks very much like what I need. I have one question, does it apply to Montville? That is are conditions different on the Blackall Range? Yes it DOES apply to Montville. In fact I live at Palmwoods just 10 minutes away and designed this guide specifically for the Sunshine Coast and SE QLD. I’ve been living here for 20 years observing the seasons and put the guide together as a local reference. Whilst we all have slightly different microclimates within the Sunshine Coast, (soils, temps etc), the seasons are the same. You can confidently follow the 5 seasons in this guide where you are. If you have the opportunity to come along to one of my free Seasonal Gardening workshops on at the moment at the libraries, you would likely get a deeper understanding of our seasons as I explain them in depth and what to plant locally. There are 4 left in September starting next week. Possibly Beerwah might be closest to you. Click here to book your free seat if interested. I hope this helps. Hope to meet you at one of the workshops if you can make it. Cheers Anne. Is there a digital version of the calendar? Unfortunately no, not at this stage. That’s because this guide has been designed for reuse, year after year, so it’s laminated. For optimum benefit, it’s meant to be used with a whiteboard marker so you can circle the plants you want to buy or sow each month and cross/wipe off when purchased/planted. You can also do the same with the tick boxes for the various key garden tasks, to make sure important jobs don’t get forgotten. A buy once, use forever model is also in line with sustainable principles. It’s ideal to keep in your garden journal folder or on the fridge. Please let me know if I can assist further William and thanks for your interest.